The Mason’s own a beautiful cedar home in Coupeville area that was designed by the homeowner who is an architect. This style of cedar home has no roof overhangs to protect the siding from the harsh exposure of weather. When you have a home built like this, it needs more maintenance than an average cedar home with overhangs. Every 3-5 years this siding will need to be maintenance washed and a new coat of Lovitt’s Natural Gold oil based wood finish applied on the harsh southern and western walls. If you decided to use an acrylic coating in this scenario, it would be a maintenance nightmare after only a few seasons. Lovitt’s is designed for long term maintenance on wood structures requiring only a light maintenance wash and recoat every 3-5 years on harsh exposures. The long term benefits of using Lovitt’s cannot be matched by any other product, period. Here is the cedar home after restoration using Lovitt’s Cleaner and Brightener to clean and remove the existing coating and followed by 2 coats of Lovitt’s Natural Gold oil based wood finish using a Pine tint. 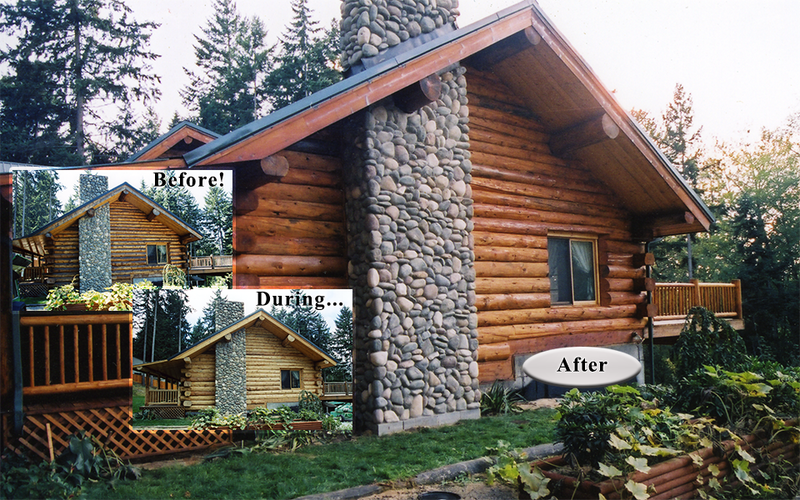 If your cedar home is looking like it needs some attention, call us for a free estimate. We serve all of Washington, Idaho, and California and have references in the hundreds. Call us now!